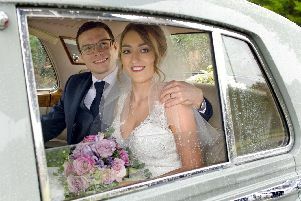 Entrepreneurs Paul Richmond and Sylvia Holmes tied the knot at a lavish wedding The Villa in Wrea Green. The hall was beautifully decorated with pink lace and cherry blossom trees and Sylvia walked down the aisle to Dinah Washington and Brook Benton’s song ‘I Do’ which made it a truly romantic affair. The couple danced back up the aisle to ‘Flash Bang Wallop’ from the musical Half a Sixpence amid the clapping of more than 120 guests, kicking off the celebrations in style with lots of fun and laughter. Sylvia and Paul met seven years ago through a mutual friend. It was a whirlwind romance and they got engaged in 2016. It was Sylvia who popped the question, using the leap year date of February 29 when women can traditionally propose. They set the date for August 4 and in the meantime opened BonBon’s Coffee bar in Penwortham. 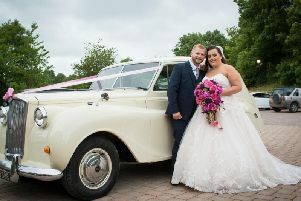 “I did wonder if I might have bitten off more than I could chew with starting a business and getting married in the same year,” said Sylvia, who is a former dental technician from Chorley. Gary Mills was the host for the evening which was themed 80s music. Sylvia added: “We would like to take this chance to thank all the professionals. The newlyweds went on to have a break in the South of England to catch up with family.